Manual espresso machines are what you are looking for to really hone the basics of your at home, hands-on barista game. These are the machines for any barista who wishes to control many of the variables required to pull the perfect espresso coffee shot. Perfection is somewhat subjective, and will vary by person, but flavor, aroma, crema, all come into it. The Final Shot: The Pavoni PC-16 take the top spot for the manual range. It is a great machine for both a novice and more experienced brewer. 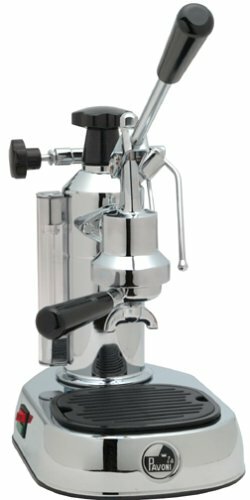 The classic lever style is easy to learn to use, the machine is simple, and it is made from top-quality materials. The ROK is a little too basic for every day and the Adreja is pretty serious price commitment for most home baristas. These machines can leave you smiling from ear to ear or crying your coffee so they are not for everybody. However when every variable for pulling the perfect coffee shot falls into place, they produce awesome espresso that is a grade above anything an automatic machine can do. With a true manual machine, you have control over the all-important pre-infusion phase – the actual pull of the extraction phase and when to end it. It’s pretty satisfying. And while the mastery of technique won’t be instant, but it is definitely something you can hone in a few weekends. You will really learn to be tune with the coffee and your machine. Variables like the bean roast, the grind, humidity, water hardness and the sometimes varying machine operating temperature. If none of those challenges put you off, then one of these machines is a great way to take your home barista experience to another level. If you’re just getting into learning the ropes of operating a manual, the ROK is a good starting point with no frills and complications. This is certainly an intriguing looking machine, and a serious conversation piece in any kitchen, not to mention a decent little gadget for making espresso. It brings to mind iconic kitchen utensils like Philippe Stark’s long legged juicer, but like all good kitchen utensils, form should follow function. This supremely manual machine requires total input from the barista, but pulling a perfect shot with your own muscles and not much else is pretty cool. The ROK Presso boasts no need for electricity, however it is certainly easier if you can plug in an electric kettle to heat your water to the required 90 degrees, or place your milk on the stove to heat before frothing for a cappuccino. The ROK itself however does not require electricity, so would be ideal for those secluded hideaways off the grid or for a camping trip. To operate the Rok, after you grind your beans separately and tamp, you just need strength in your shoulders and upper arms to pull 9 bar pressure. It is that simple. It definitely takes some practice to get it right, but it isn’t over-complicated by frills and bells and whistles not essential to the process. The frother is manual too and while it does not produce micro foam, it is passable. For novelty and design alone I love this machine, but as a bonus, it actually produces some decent espresso coffee. This is a classically manual machine operating on a manual lever to pull each shot. Almost every step requires input from a skilled barista to achieve an extraction with quality and uniformity. The La Pavoni PC-16 is designed to bring the coffee artist out in you, once you have mastered some of the science behind the method. I personally love the beautifully finished metal workshop look of these handcrafted machines. They remind me of an old European master’s workshop. It is old world and beautiful to look at. One of the advantages of a manual lever machine is the control the barista has over the pre-infusion of the selectively ground roasted beans, the make or break of a perfectly pulled espresso. Pre-infusion wets the grinds evenly and just enough to prep them for the pressure of the extraction. The barista, you, raise the lever slowly to the count of 5 (and yes that depends on how fast you count) then lower the lever to pull the shot. You are the pump or the spring so you decide how fast and how hard. After a while, you’ll come to learn how to do this by feel. In fact, as the barista, you control almost everything: the choice of roasted bean (or roast your own), the grind, the amount, the tamper, the heat of the cup, the pre-infusion, the pull and the ultimate fate of your shot. There is a pressure gauge to assist you throughout the process, but once you have the feel for your machine you probably won’t look at it so often. The water boiler needs to be refilled regularly and there is an indicator window to show water level. There is also a steam wand for lattes and cappuccinos. This is a hard working, beautiful hand crafted machine that makes a statement anywhere. It also has a solid 3.5 out of 5 rating on Amazon. This machine is a serious upgrade from the ROK when it comes to a manual lever action machine and definitely a high-end experience. It has all the shiny bells and whistles you could want for a serious barista experience. The pre-infusion and pressure are still applied by a water pump, but the barista has a great deal of control about grinding the beans as fine as they choose, adding a certain amount of grinds to the basket in the group head, tamping pressure and starting and finishing the pull of the shot. There is no program to repeat for every shot, so the barista will be watching the shot being poured and shutting it down at the end of the crema, before any thin, bitter oils start to be extracted from the grinds. The Quickmill Andreja certainly looks the part, sleek and shiny with commercial rugged good looks of stainless steel that would light up any barista’s counter. At 55 pounds it is no lightweight, figuratively or literally. The Andreja also has a space on the top to make sure cups are kept warm, although you might need to warm them further with hot water if you like piping hot drinks. It features both a steam wand and separate hot water dispenser, so there are options for steaming milk and making water-based coffees, like an Americano or even teas. The turn knobs can be exchanged for ergonomic flick switches that operate in four directions. The manually filled water tank has an audible alarm that sounds when the water reservoir is getting low. If you don’t react at that stage it switches to another alarm that allows you to take another shot or two then switches off the boiler but the pump system. The drip tray is very easily emptied by sliding out the front, rather than lifting out the grid and tray from the top. This machine would make a handsome addition to any busy domestic kitchen or even a small café. The quality is that good. It also has a stellar 4.5 out of 5 star rating on Amazon. The Pavoni Europiccola 8 is the little brother of the PC-16 and is perfect for both novice and intermediate home baristas. The smaller water reservoir holds enough to make eight 2 oz espresso servings before needing to be refilled. There is a water level indicator window for easy reference. However, it quickly becomes a habit to top it up every morning before heating the machine. This machine also allows the barista to control all the variables for every shot – bean choice, grind, amount, tamper, pre-infusion and pull speed and pressure. Like most espresso machines, the size of the grind is important, so it is also key to invest in a quality grinder to get the best from this machine. Grind is also affected by humidity so you’ll need to make adjustments as you go, especially if humidity changes regularly. Brewing temperature is controlled by an internal thermostat; however, you should learn the subtleties of their machine to avoid temperature changes, switching it off and on to “surf” the optimum temperatures for consecutive shots. The Pavoni Europiccola 8 is the perfect hand crafted machine for hand crafted espressos. 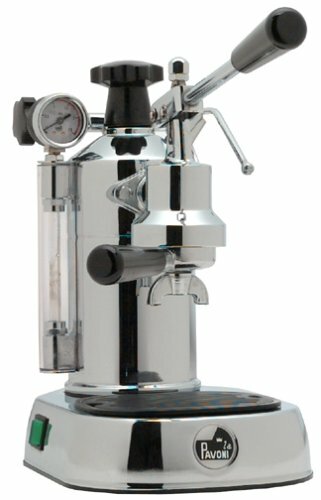 This article aims to find a great manual machine for any home barista experience level and any of these options are great picks for a barista who wants to learn to use their machine like the pros.